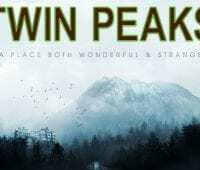 There’s a certain amount of quirkiness that people expect from Twin Peaks, especially as the years have passed since its original run. I mentioned this last week, but often people boil it down to just that quirkiness. This week the show leans hard into it–into the David Lynch of it all. First of all, apologies for the lateness–I was stuck between dimensions. Second of all, so was Agent Cooper. In an incredible, almost wordless, surreal opening sequence, Cooper manages to work his way back into our world, but his return doesn’t come without problems. Obviously, Evil Cooper anticipated that the original might return someday and so he “manufactured” a contingency plan. That plan is one Dougie Jones (still Kyle MacLachlan), who seems to be living a sleazeball life in Las Vegas. When we meet him, he’s just had a, how do you say, rendezvous with Jade. As she gets cleaned up, our man Coop crosses back into our world, causing Dougie (and Evil Coop, still in South Dakota) to vomit garmonbozia. Evil Cooper just wrecks his car, but poor Dougie is beamed into the Red Room, where he doesn’t last long. 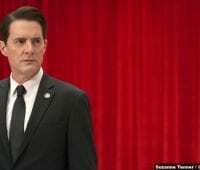 As for the state of Agent Cooper–granted, time passes differently in the Lodge, so I don’t know exactly how long it’s felt to Coop that he’s been gone. But he comes back almost toddler-like–his only speech is parroting bits of what other people say and he doesn’t seem fully in control of his bodily functions. Jade drops him off at a casino, where he wins so big (by following visions of the Red Room) that the casino drives him home. Or rather, they drive him to Dougie’s home. Dougie’s home life almost seems as manufactured as him. One clue is the odd names of his wife and son–Janey-E (Naomi Watts) and Sonny Jim (Pierce Gagnon). His son’s name is Sonny Jim Jones? And yes, I know in a show like Twin Peaks, it’s funny for me to picking out names as what’s weird. But it’s so unsettling how Janey-E doesn’t seem to notice that her husband is acting very strangely, especially when he comes to breakfast with his tie wrapped around his head. Meanwhile, Sonny Jim oscillates between bemusement and flashes of what looks like fear. As for our Coop, he almost seems to have a breakthrough once he gets some (damn fine?) coffee in him. But we’ll have to wait until next week to see if he’s closer to fine. 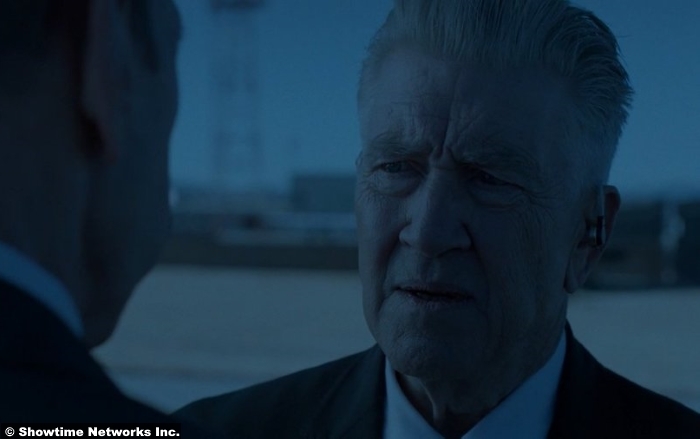 Back in Twin Peaks, Hawk is still trying to puzzle out what’s missing (as per the message from the log last week). He’s got all the evidence from the old investigation spread out in a conference room and donut disturb. It’s not chocolate bunnies, is it? No, it’s not. But what if–no, no chocolate bunnies. Discussion time: If it’s an actual, tangible thing, I think it’s Laura’s secret diary. Coincidentally, I’ve never actually read The Secret Diary of Laura Palmer–my mom wouldn’t let me buy it when it came out–so I’m going to do that this week and really start building my evidence wall. Anyway, if it’s not a real thing, it could be anything. What do y’all think it is? While we’re at the sheriff’s office, we meet another member of the force, who is a very familiar face: Bobby Briggs (Dana Ashbrook). 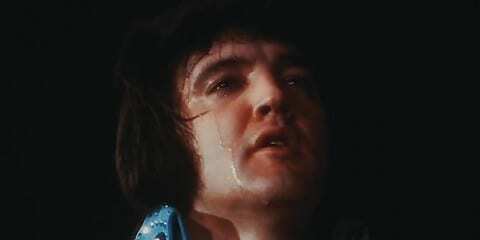 He is a silver fox now, but still gets choked up at the loss of Laura. He also shares with Truman that Cooper was the last person to see his dad, Major Garland Briggs (Don S. Davis), before the major died in a mysterious fire. By the way, when Coop was traveling back to us, he saw an image of Briggs’s floating head, who said, “Blue rose.” If you don’t recall, blue rose seems to be the designation for FBI cases that have a touch of the supernatural. And if you’re saying, “You mean an x-file?”, well…maybe. And speaking of blue roses, we got to visit some old friends from the FBI this week, Agent Gordon Cole (David Lynch) and Agent Albert Rosenfield (Miguel Ferrer). 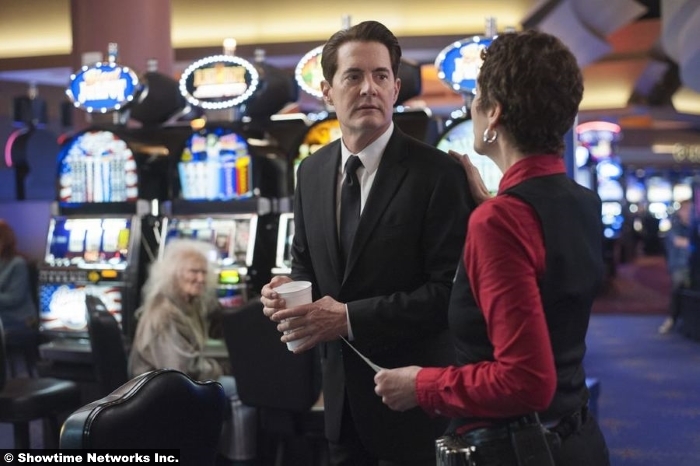 New agent Tamara Preston (Chrysta Bell) is just getting them up to speed on that NYC glass box (from last week) when Cole gets a very important phone call: Agent Cooper has possibly been located. Unfortunately, it’s a call from South Dakota, where they’re holding Evil Coop, and not from Las Vegas. Before leaving for SD, Cole stops to check in with the FBI Chief of Staff, who is now Denise Bryson (David Duchovny). You mentioned x-files? Anyway, she gives her support for the trip to SD, where Evil Coop is being held in federal custody. It is immediately obvious that something is off with him. First of all, he almost seems to lapse into Red Room-esque backwards-speak when he first greets Cole. Also, I noticed (but failed to mention) last week that Evil Coop has a very flat affect, making him sound a bit robotic. He certainly sounds that way when he keeps repeating “I need to be debriefed by you” to Cole. He claims to have been working with Agent Phillip Jeffries (David Bowie), but Jeffries hasn’t been seen since 1989. Outside, in an amazing meta comment, Cole says, “Albert, I hate to admit this, but I don’t understand this situation at all.” “Blue rose,” Albert tells him, to which Cole replies, “It doesn’t get any bluer.” And like another late musician, we’re left wondering, how blue can you get? 9/10 – Like the odd little scene in part 3 where Lawrence Jacoby (Russ Tamblyn) is using a rope and pulley system to help him paint some shovels gold, this could all add up to a big ball of nothing. Or we could be digging gold. It’s too early to tell now, but if you’re not in, you’re probably not going to be. But me? I am so here for this.